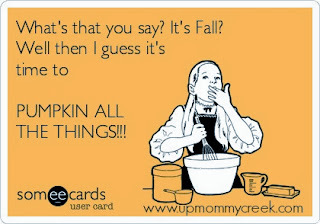 It's fall, which means it's that time of year to PUMPKIN ALL THE THINGS!!!!! I have to admit I'm a late convert to the pumpkin craze. I actually don't like pumpkin pie (gasp!!) so I was pretty reluctant to think I would enjoy pumpkiny goodness in every single incarnation. Turns out it's actually really yummy! If you know me at all, you know I am pretty addicted to Starbucks; I love their Pumpkin Spice Lattes. I have tried for a few years now to recreate a similar coffee at home, and have tried everything from syrup to creamer recipes. None have ever really made the cut. Most of the time they are either really sweet, or they have a pretty gritty texture which I'm not a fan of. But I have finally found it! This latte tastes pumpkin-y and spicy and coffee-y...just right. 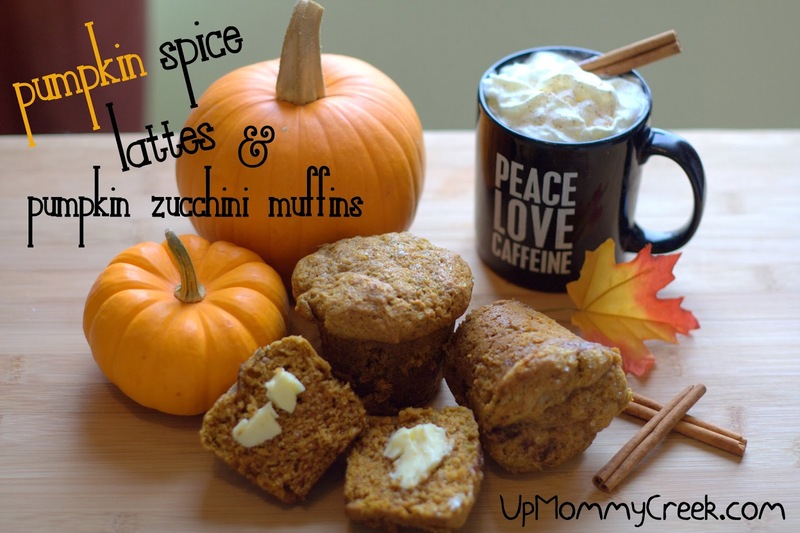 And because you can't have a cup of coffee without a treat, I also whipped up some pumpkin zucchini muffins to go with them. I don't like zucchini at all, actually, but for some reason it tastes delicious in baked goods. So it seemed natural to toss some pumpkin in there too and make a fall pumpkin explosion. They are super moist and tender, and since they have 2 types of veggies in them, I feel like they are basically a health food. It would be easy to "healthify" this recipe a bit by subbing some whole wheat flour for the white, and reducing the sugar a bit, but I like em just like this. Place 2 1/4 cups of milk in a saucepan. Whisk in 3 Tbsps of pumpkin puree, 3 Tbsps of white sugar, 1 Tbsp of vanilla and 1/2 tsp pumpkin pie spice. Bring to a simmer. Add in 2 shots of espresso (I use my Tassimo for that) or 1/2 cup of strong coffee (to your taste). Pour into a mug and top with whipped cream and a dash of pumpkin pie spice. I didn't find the texture too gritty, but run it through a fine sieve or some cheesecloth first if desired. If you have a bit leftover, but it's not enough for a full cup, it's also delicious if you add a little bit to your regular latte or coffee. Yum yum! Combine flour, baking powder, baking soda, salt and spices in bowl. Set aside. Cream butter and sugars for about 5 minutes until creamy and well incorporated. Add in eggs and combine well. Add vanilla, ginger and pumpkin and combine. Add zucchini and stir until mixed. Slowly add flour mix and stir until combined. Scoop batter into muffin pan (I use a silicone one so they just pop right out...they are amazing!) until almost full. Top with some cinnamon sugar if desired. Bake in a 325 degree oven for 20-25 mins until toothpick comes out clean. Thanks for sharing! I strained mine through a sieve yesterday and it got out lots of grit, good idea to keep stirring this as well!